BR0842 – Beautiful newly built traditional Dalmatian style stone house for sale Brac in the picturesque village Nerezisca. The charming property is situated on a 250m2 plot with a carefully landscaped garden with nice stone features. The internal living area is 75m2, there is a ground floor and an attic. The 40m2 ground floor consists of a bathroom, kitchen with a dining and sitting room, the sitting room has a lovely fireplace clad in Brac stone. A spiral staircase leads to the upper floor of 35m2 which contains a bedroom and a living room with a beautiful view of the village and the beautiful scenery with the sea and islands in the distance. The combination of laminated wood flooring, oak carpentry and natural Brac stone gives the property a special warm look and all the details and materials are superbly integrated into one harmonious whole. 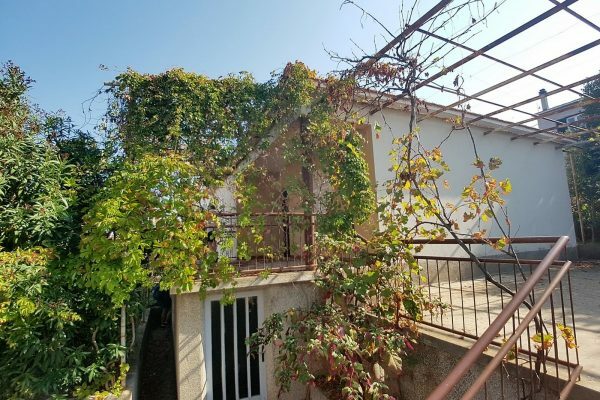 The house for sale Brac is fully air-conditioned and nicely decorated. In front and to the side of the house there are spacious covered terraces, excellent for lounging and outdoor dining. The house has a beautifully landscaped garden with authentic plants and flowers. In the garden there is a lovely lawn with a masonry barbecue and there is a patio with an outdoor shower. The small village of Nerezisca are a picturesque settlement in the inland of the island Brac. The village is only 10km away from the biggest town and main ferry port on the island, Supetar. The village is secluded and quiet, surrounded with beautiful pine woods, vineyards and olive groves. The ideal place to relax and enjoy a stress free holiday.